HWF 2019 The 2019 festival will take place from Thursday 10th to Sunday 13th October 2019. The walk programme will be published on the website in early summer and we look forward to welcoming you to Hay in the autumn. Please join our mailing list if you’d like to be informed as soon as walks are live! 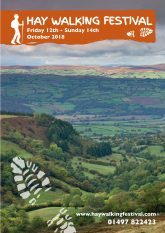 The Hay on Wye Walking Festival is a celebration of two-footed fun in and around the beautiful border town of Hay on Wye. We warmly invite you to join us from Thursday 10th to Sunday 13th October 2019 to enjoy our lush countryside, stunning hills and to step into our beautiful town of independent shops, a proudly chain-store free destination. Our walks programme, spread over four days, will be broad ranging in terms of geography and interest. There is something for all abilities and interests – all day in the hills, town walks, historical walks, a chance to learn from experts and exclusive access to paths and sites not normally open to the public. Walks are graded according to difficulty and are led by experienced walk leaders, all of whom know and love the area covered and have themselves been traversing the area for many years. Perched on the Wales-England border on the edge of the Brecon Beacons National Park, Hay on Wye is blessed with a wonderful mosaic of landscapes which is not only scenically stunning but also steeped in the stories of those who have lived, fought, worked or travelled through the area over the millennia. Our programme of walks reflects this variety. The 2019 Hay Walking Festival is an opportunity to explore woods, hills, moorland, ancient sites, nature reserves and more. Make the most of a long weekend and join us for our evening events. A number of walks start in Hay itself, while transport will be required to access more distant walks. We would encourage you to use public transport where possible, to car share or to use a local taxi service to help us preserve the natural environment and quietude which makes this area so special.